The past year or two, we've become fascinated by medicinal mushrooms. They have been pretty life changing for us and are a huge passion of ours. So much so, we're hoping to volunteer on a mushroom farm later this year and learn all about cultivating fungi... which we're so excited for! The historical importance of mushrooms is often undervalued by mainstream society and western medicine. Mushrooms have been used for thousands of years as food, medicine and as part of spiritual practices in a range of different communities and religions. The more we learn about the fungi kingdom, the more we recognise their value in the ecosystem - they are quite literally all around us and hold so much potential! Humans are closely related to the Fungi Kingdom, therefore their benefits are lovingly received and recognised by the human body. So what makes a medicinal mushroom any different from those you'd find in the veggie section? Medicinal Mushrooms are mushrooms with powerful healing properties and health benefits. When we consume these mushrooms that are rich in medicinal qualities, we absorb a variety of medicinal constituents and nutrients, increasing health and vitality. These types of mushrooms have been such a valuable medicine for thousands of years, most notably in TCM (Traditional Chinese Medicine). Our favourite way to use mushrooms is to make warm tonics or elixirs with nut/ oat / coconut milk. We have a recipe for our favourite cacao tonic here. You can also take the mushrooms in tincture form. When taking mushrooms, a small amount goes a long way. We use roughly 1/2 teaspoon each time, so although buying the mushrooms can initially feel expensive, they last for a very long time as they are so potent. Known as The Queen of the fungi kingdom and The mushroom of Immortality - reishi was the first medicinal mushroom I tried and I fell in love with immediately. The effects of this mushrooms are so calming for the nervous system - I can quite literally feel the relaxing, grounding effects when I take it. Reishi is best known in Chinese Medicine for its immune boosting properties and is prescribed for vitality and general wellbeing. Full of amino acids, polysaccharides, vitamins and minerals ... it's a super fungi full of healing magic. If you're looking to start somewhere, we recommend Reishi. If Reishi is the Queen of mushrooms, then Chaga is known as the healing King. Growing wild on birch trees in various parts of the world, the chaga fungus absorbs some of the powerful nutrients from the tree. It is known to be incredibly alkalising and a rich of source of antioxidants (which protect the body from free radical damage) and has been used for hundreds of years as a remedy for illnesses. Various studies have been released on the healing effects of Chaga against certain forms of cancer. (google Alexander Solzhenitsyn's book The Cancer Ward). Chaga chunks can be decocted into a powerful tea to promote immunity and wellness, or else it is available in powder form from various companies. The cordyceps fungus is truly fascinating as it grows in the high altitudes of the Himalayas... on caterpillars (!). This mushroom has an incredible reputation for increasing stamina, vitality and strength. It's often referred to as being the mushroom for improving athletic performance and enhancing energy. Prescribed in TCM to support the function of the lungs and kidneys, it's also suggested to strengthen the immune system. Often used as a nerve tonic - Lions Mane can be taken to support nerve and brain function, as well as aiding digestion. Modern studies have shown it to be a potential medicine for helping diseases such as Alzheimers and dementia. It's rich in amino acids, minerals and can enhance the function of the immune system! 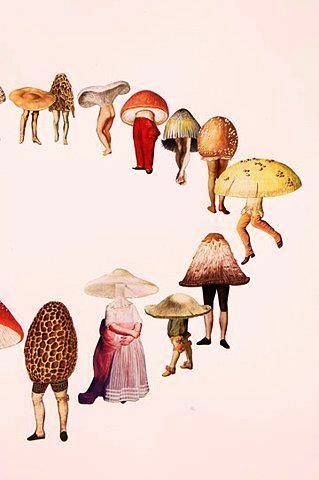 We hope you enjoyed this post...we'd love to hear about anyones experiences with medicinal mushrooms or recommendations you have!